Our nephew is getting married this upcoming weekend and we are giving them gift cards. The bride chose colors similar to Stampin' Up! 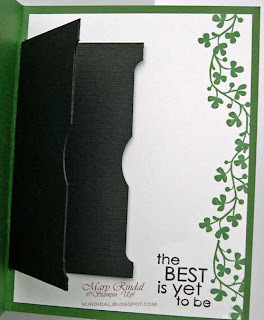 's Garden Green with Black and White for her wedding colors. So that was the inspiration for my card. I have made gift card holders similar to this before that were singles, but this time wanted to add another folder to it as well - to accommodate two gift cards. I originally had a flap on each end to adhere it to the inside of the card base and those covered with the card liner - well it was just TOO bulky. So I started blog browsing and saw that Shelli (Stampin' Up! co-founder and President) on soshelli.com had made similar gift card holders recently and she SEWED the inside folder to the card base - brilliant! And I also found a beautiful card design for the outside. So here is my final result. What do you think? For the front of my card, I created a mask using a 4 1/4 x 5 1/2 piece of scrap card stock. I penciled a rectangle in the center and then cut it out with my Hobby Blade, Mat Pack cutting pad and a ruler. I used Dotto Temporary Adhesive to stick it down to my Garden Green Textured card stock. TIP: Hello beautiful texture - love this textured cardstock AND it's included in the Buy 3, Get 1 Free promotion this month! Don't forget this sale ends on May 31st. I loaded up the En Francais background stamp with Basic Black Craft Ink and then laid it wood side down on the table so I could carefully lay my card front on top of it. I used Clear Embossing Powder and my Heat Gun to emboss it for a beautiful shine. 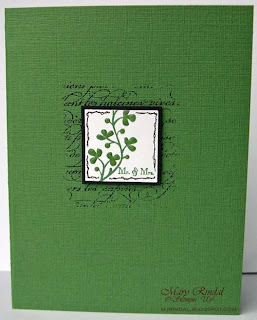 The leaf print is from the stamp set Fresh Cuts stamped in Garden Green ink onto Whisper White. I also stamped the Mr and Mrs sentiment from All Holidays on there. This is punched out with the 1 1/4" Square Punch and a border doodled with the Black Stampin' Write Journaler. I put it a mat of Basic Black punched with the 1 3/8" Square Punch and adhered it with Stampin' Dimensionals to the center of my embossed script. Then I used Crystal Effects to add dimension and shine to each of the leaves and set it aside to dry. For the two Gift Card folders inside, I scored and folded a piece of 4x9 Basic Black Textured card stock at 2 1/4, 4 1/2 and 6 3/4" inches. Then I used Tombow Mono Multi to seal the top and bottom inside edges on each folder. The fold side of each one is punched with a Word Window Punch twice and a Circle Punch for the thumb tab. I sewed it to the card base down the center fold line. I LOVE it! You did a fabulous job!! I really like this! Lucky bride and groom!